Where Will Supply Chain Take Your Supply Chain? When people think of drones and supply chain, they typically think of Amazon’s unmanned air force delivering packages on their front porches. But drones and other emerging technologies will have a much more far-ranging impact on supply chain than just customer delivery (but don’t think that’s not going to happen soon, too). 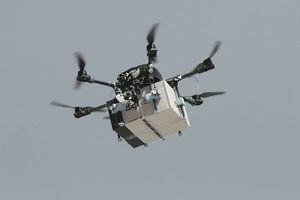 Drones can do more than deliver goods. One near-term use for drones is within the realm of inventory management. Drones are being tested for their usefulness inside warehouses. Imagine using drones to fly throughout your warehouse and scan the bar codes of your inventory. Drones can confirm inventory in a fraction of the time that a team of people can. Drones aren’t the only emerging technology that is looking to replace your inventory control team. Non-flying technology—i.e. robots—are being designed to do the same thing. The warehouses of the future might have robotic inventory control teams, but other unmanned vehicles will also be tooling around those warehouses, too. Before you know it, forklifts won’t need operators. The same emerging technology that’s being used to put autonomous vehicles on our roads can easily put autonomous forklifts in the controlled environment of a warehouse. While your inventory control drones are flying around making sure you have 100 percent inventory accuracy, autonomous trucks will be pulling up to your loading docks and your autonomous forklifts unload them. Human warehouse employees might be relegated to museums. The use of technology to replace human employees isn't anything new. It wasn't that long ago that we had people operating our toll booths. Cashiers look like they're on the chopping block. In the early 1990's, most large corporations still had "secretaries" who would become "assistants" within a few years—at least the ones who were left after email, phone systems, the internet and Kuerigs made it possible for middle managers to do those tasks. Phone switch operators used to crowd basements of office buildings. Garbage trucks used to have three "sanitation engineers" operate them—one to drive and two to empty the cans. Now, most garbage trucks have a driver who operates mechanical arms inside the cab. How long do you think it will take to make that an autonomous process? Heck, technology was been replacing human employment ever since someone slapped two wheels on a piece of wood and used their newfangled wheelbarrow to replace the Neanderthals who had been hauling rocks by hand. What are the primary drivers that are pushing these emerging technologies to the revolutionize logistics, supply chain and customer delivery? Sure, it will take some capital investment to replace your delivery trucks with drones and inventory control team with robots and manned forklifts with driverless forklifts, but once that investment is made, well, costs will go down, efficiencies will be optimized and safety issues will become a thing of the past. So other than drones and other unmanned vehicles, what other emerging technologies are going to change how you run your supply chain and business? 3D printing is right on the cusp of becoming more than a curiosity. Sure, your kid can knock out a cool key chain that she CAD modeled at school—but sooner than you think, 3D printing will become faster and it will be able to hold industrial tolerances and specifications and it will become cheaper. And that's when everything from the cars that our robots drive to organs that our surgical robots implant in us will be 3D printed. GPS has been with us for awhile but it's evolved from a top secret military tool to something in our phones that we don't even think about. With advanced, micro-accurate GPS, you'll be able to track your products—not only when they're shipping to your warehouse from a low cost manufacturing region—but on your production line and in your warehouse. And you'll do that on the online interface you have in your contact lens. Advance artificial intelligence is the real game changer. I don't even think real futurists know where A.I. is going to take us. But it's in its infancy and already, we have smart homes with devices in them that can shop for us. Once that technology is applied to business on a wide scale, the future will really have arrived.